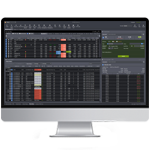 With access to 10 global exchanges (SGX, NYSE, NYSE-MKT, NASDAQ, LSE, TSE, Bursa, HKEx, SSE-A, SZSE-A), you can trade Equities, CFDs, Unit Trusts, Futures and Forex with just a single login. Now that watchlists are double in size and no longer limited , you can build a multi-asset, multi-market watchlist that comprises of your favourite counters. Be alerted for market movement, order statuses, promotions and account-related transactions anywhere you are. Log into your account anytime with just your fingerprint (POEMS Touch ID) and Remember My Account feature. Logging into POEMS Mobile has never been easier! What are the supported operating systems / devices for POEMS Mobile 2.0? Where do I download POEMS Mobile 2.0? What are the assets tradable on POEMS Mobile 2.0? What are the exchanges / markets supported on POEMS Mobile 2.0? What is the login for POEMS Mobile 2.0? POEMS Mobile shares the same login credentials (Account number and password) as the rest of the POEMS platforms. Why do I get a “Login failed” message when I try to login? You could have keyed in the wrong account number or password. Please note that the password is case sensitive. Can I change my password on POEMS Mobile 2.0? Kindly note that the change of password will apply to all of POEMS platform access. Am I able to remove the default setting which logs me out automatically? Yes, this is customizable. After logging in, please go to Settings > Login and Passwords > Session Timeout. Select <No session timeout>. Kindly note that this option prevents the app from logging user out; however passwords are still required for any transactions made after one hour of session inactivity. Why do I see the loading circle (progress bar) for an extended period of time? The application may require strong internet connection and you may experience slow loading in areas with low network coverage. If this problem persists you should contact your mobile data subscriber or check your Wi-Fi connection. What is POEMS Touch ID / Face ID and how does it work? POEMS Touch ID / Face ID is available on both iOS and Android devices. Using the POEMS Touch ID / Face ID allows the user to log into the app with fingerprint / facial recognition without having to input your login credentials. First time registration is required for POEMS Touch ID / Face ID – on the login screen, simply tap on the “Touch ID” or “Face ID” icon to register with your POEMS account number and password. How do I “de-activate” POEMS Touch ID / Face ID? To de-activate or change an account activated for POEMS Touch ID / Face ID: after log in, please go to Settings > Logins and Passwords > Enable Touch ID / Face ID on Login and “turn off” the corresponding switch. Is 2FA (Two-Factor Authentication) supported on POEMS Mobile 2.0? Yes, 2FA is supported on POEMS Mobile 2.0. However, activation or linkage of 2FA can only be done via POEMS 2.0 (desktop). For more information on 2FA activation, please click here. Why am I receiving timeout errors? Timeout errors are often attributable to a temporary fault to the server such as poor data connection or poor signal. Please switch to a stronger signal provider or contact your mobile data subscriber should this problem persists. 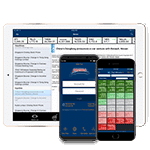 Do brokerage commissions apply and what are the rates when I trade using POEMS Mobile 2.0? Yes. Standard POEMS online brokerage commissions apply. The latest online rates for respective markets can be found here. Can I access POEMS Mobile 2.0 when I am overseas? Yes. As long as there is internet connection on your mobile phone, you can access POEMS Mobile 2.0. Internet connection can be via high speed mobile connection (i.e. 3G/4G) or Wi-Fi. Please check with your telecommunication service provider for the applicable roaming charges when you are overseas. Can I trade using my margin account on POEMS Mobile 2.0? Yes, available for all margin account holders. How do watchlists work on POEMS Mobile 2.0? Do I need to import my saved counters previously? You will be able to add/delete your favourite counters to/from your watch lists on POEMS Mobile 2.0. All watchlists are synchronized with POEMS 2.0 (desktop). You will be able to create 10 watchlists from different exchanges/asset classes and customize it to your preference; each watchlist can save up to 50 instruments. All watchlists are auto-saved on POEMS Mobile 2.0 and there is no need to import your instruments from previous POEMS Mobile apps. Is the market information displayed on POEMS Mobile 2.0 in real time? All market information displayed are ‘live’ unless otherwise denoted by * which means that the information is delayed by 15 – 30 minutes. If I did not subscribe to the US / SET / Bursa / TSE / HKEx live prices, what will I see on POEMS Mobile 2.0? You may access to the respective live prices in POEMS Mobile if you have subscribed to them. Otherwise, you will see delayed prices. Can I select my settlement mode and currency? You may choose to pay in cash, CPF or SRS in Singapore dollars or the traded currency (where applicable). Where can I see my trading limits? 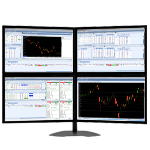 Your trading limits (Buy/Sell) will be shown at the bottom panel on the “Trade Screens” of your selected instrument. What happens to my orders after I have placed them on POEMS Mobile 2.0? All orders placed using POEMS Mobile 2.0 can be viewed, amended (quantities) and withdrawn from the Order Status screen. You can also view the status of your orders for the past 7 days in this module, including Good-Till-Date (GTD) orders. Is the order status in POEMS Mobile 2.0 synced with POEMS 2.0 (desktop)? Yes, the orders that you placed through POEMS Mobile 2.0 will be reflected in the order status page in POEMS 2.0 (desktop) and vice-versa. What is POEMS Mobile 2.0 Alerts? Order Alerts: Be alerted for order-specific notifications. You can trigger alerts when your order has been received, done, rejected, withdrawn, amended and more. Announcements: Important announcements such as system maintenance, trading holidays or promotions are triggered here. POEMS Mobile 2.0 Alerts are synchronized with POEMS 2.0 (desktop). Kindly note that POEMS Mobile 2.0 Alerts is a value-added service provided to you free-of-charge. As the Push Notification Service is provisioned by Apple/Android operating systems, POEMS cannot guarantee the successful or timely receipt of the alerts. What is “My News” and how does it work? “My News” refers to related news specific to the counters / instruments you have saved on your watchlists. If you would prefer all news to be shown, you can “turn off” the auto detection option under the “News Options” setting found in the top right hand corner of the “News” module. How do I withdraw funds or convert currencies? For funds withdrawal or currency conversion from your account, please go to “Online Forms” after logging into the app. You can view all transactions performed for Online Forms under “Transaction History” on POEMS Mobile 2.0, or via the same module on POEMS 2.0 (desktop). What is UT Basket and how does it work? UT (Unit Trust) basket works like a shopping cart, and allows funds to be easily “checked out” in one transaction. Up to 5 funds can be added to UT Basket. What is FX Invest and how does it work? 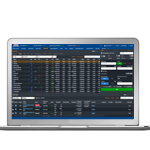 FX Invest is designed to facilitate forex trading easily. Within the module, you may view your currency pairs, latest transaction history and equity balances /available funds for your forex account. Kindly note that a separate Futures/Forex account must be opened or maintained under Phillip Futures in order to access FX Invest. What should I do to logout properly? For security reasons, we strongly advise all users to perform a logout after each session. This can be done by tapping on the Menu > Logout (last option). What will happen to the old POEMS Mobile apps that I am currently using? The older versions (or POEMS Mobile 1.0) will be maintained only for a short period of time and will be removed from the app stores in due course. We will inform all users on the discontinuation of the older version (or POEMS Mobile 1.0) closer to date. Where can I learn more / view the user guide? You can download the POEMS Mobile 2.0 User Guide or contact your Trading Representatives (TRs) to find out more our POEMS Mobile 2.0 exclusive promotions.